A car owner encountered an unfortunate experience after the back glass of his Toyota Fortuner was hit by a golf ball in Quezon City on Friday. 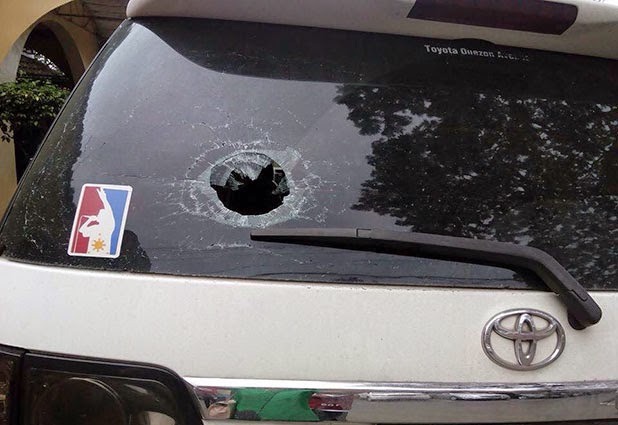 "Hit by a golf ball while passing in front of Veterans Golf Club going to Quezon City Memorial Circle" was how Manny Nuezca described the broken glass of his vehicle's rear window, a photo of which was posted January 9 on the Facebook page of Top Gear Philippines. Luckily, the impact didn't cause harm to anyone inside the SUV. "Thank God me and my wife didnt [get] hurt since the interior of the Fortuner is carpeted so the golf didnt [bounce]," he commented. According to Nuezca, the person who hit his car "admitted his fault" and both of them signed an affidavit. In a separate post, he identified the player as Mark Echiverri who, he said, owns the canteen inside the golf club. Besides the hassle, Nuezca said he is facing yet another problem. The golf club can only pay him P5,000 for the damage, which will take two weeks to process, and Echiverri "will shoulder whatever exceeds of the amount." However, the player apparently hasn't shown up and the "golf club's assistance is close to zero," he shared. On Friday night, Nuezca posted a follow-up status saying he learned from other TGP followers that this kind of accident already happened "more than twice" in the same area, something that has bothered several netizens who frequent the page. They asked: "What if a passerby rather than the Fortuner had been struck on the head hard with the golf ball?"